• What are Additional classes? There are two types of classes in the Teachers Dashboard: Home and Additional. All Makers Empire users must be assigned to one Home class. A Home class is typically a student's home room, e.g. Room 5 or Ms. Apple's Class. 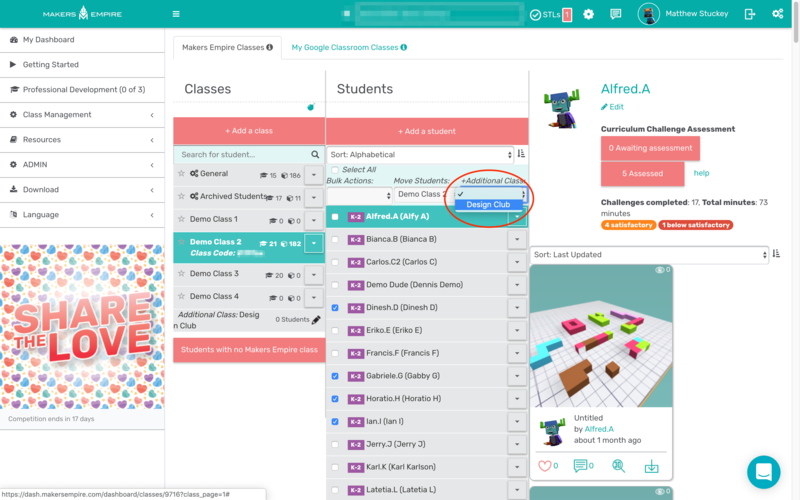 If your students create new accounts in Makers Empire 3D by themselves, they will select their Home class as part of the new account process. If you create accounts for your students in the Teachers Dashboard, they will already be in their Home class. Students can also be assigned to multiple Additional classes. These can be specialist subjects, e.g. Art & Design class, Tech class, or extra-curricular classes e.g. STEM club or Lunchtime Computer Club. These Additional classes are only visible in the Teacher's Dashboard, i.e. students do not see them in Makers Empire 3D. 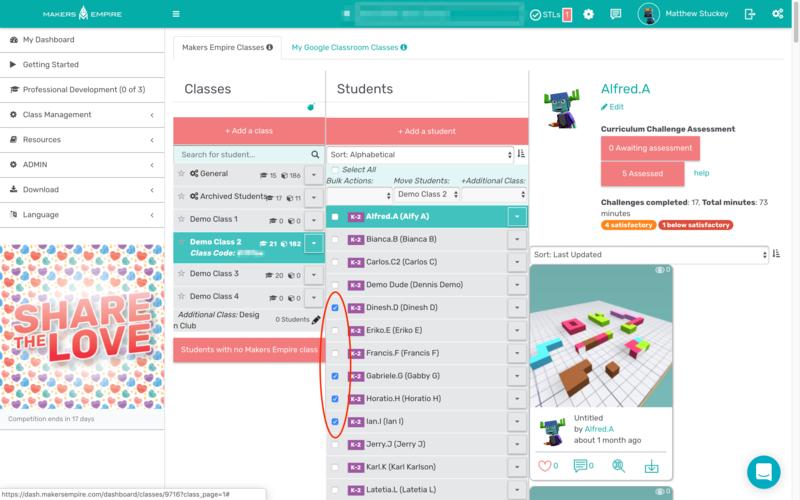 Using Additional classes makes it make easier for teachers of these additional classes to find all of their group members in one place, rather than searching class by class e.g. Ms. Ball runs a lunch time STEM club with students from several different Home classes, to find their work she can simply search in "Stem club". 2. Click the + Add a Class button. 3. Give your new class a name and note the grade level(s) if applicable. Use the radio button (circle) to select Additional. Assign the primary teacher for this class, then click Save. 2. Use the tick boxes to select the students you wish to add to your additional class. 3. Click the + Additional Class dropdown menu (above the students' name) and select your Additional class.